The year 2011 is rapidly nearing its end and Christmas is not so far away. We here at Mindcore would like to thank all our fans for their support over the year which has certainly been one of our greatest. 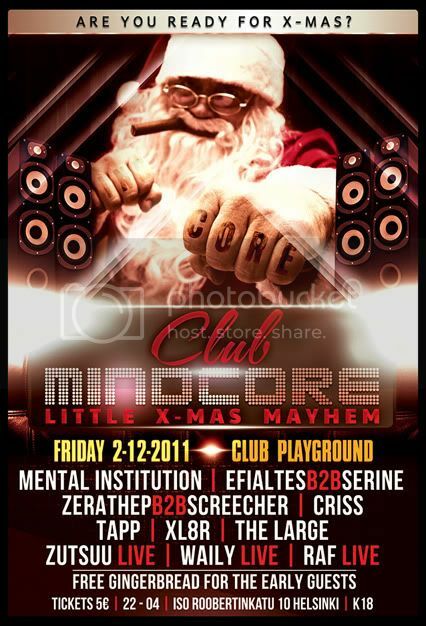 In order to close the year 2011 for us and to make the remaining time more fun we are hosting our first ever X-Mas special on Friday 2nd of December @ Club Playground. As always we have prepared you a mind blowing lineup of DJ's to keep your feet moving throughout the night. Also in order keep the X-Mas spirit alive we are serving free gingerbread snacks for our early guests. Come and take your friends with you to the Hardest X-Mas party in the city.